Take a ride . . .
With rolling hills and hollows, pastures and forests, rivers, lakes and plain communities, Tompkinsville offers a diverse environment for exploration and fun. Before you begin stop in at the Monroe County Tourism Office and get a map of the Historical Highway Markers and the Quilt Barns in the county. You’ll want to watch for them throughout your day. The Historical Highway Markers detail everything from Monroe County’s role in the Civil War to the county’s first electricity! 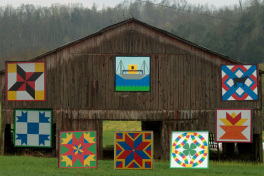 The Quilt Barns are a beautiful reminder of the resourcefulness of the pioneers that settled here. Begin your day at the Old Mulkey Meetinghouse State Historic Site. 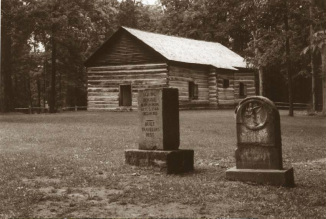 Built in 1804 the Meetinghouse watches over the graves of American Revolutionary Soldiers, Civil War soldiers, and Hannah Boone (Daniel Boone's sister). For an in-depth look at the site try your luck at the park’s quest, “The View from the Pulpit”. Looking to interact with Mother Nature? Take an Observation Hike or visit "The Flock", Old Mulkey's newly established Birding Site. Approximately 1.75 miles from the park you’ll find the Monroe County/Boyd One-Room Schoolhouse. The recently restored facility brings to life the rural school experience of Monroe County children from 1888 to 1966. Have a seat in an authentic period desk and let the surrounding artifacts take you back in time. Time for lunch? Dovie’s Cafe is minutes away. This “mom and pop” joint has been serving up their unique burger for the biggest part of a century. Here the question isn’t rare, medium or well done, it’s squeezed or not! When you’re ready to get back on the road we recommend a visit to one of our many Amish, Mennonite, or Plain People communities. Their traditional ways take you back to life without electricity and a working knowledge to "live off the land". You can shop for fresh produce, sorghum, garden "sets" and more at these communities. In the Plain People Community of Vernon you can visit the iridologist and herbalist or stop by the working leather and shoe shops. Check your watch? If it’s close to 4:00 you’ll want to head to the Monroe County Marble Super Dome. There you’ll find grown men and kids playing competitive marbles on a daily basis. A Monroe County tradition, these players are serious about marbles. They've even won World Championship Marble Tournaments! What’s your marble game? Our favorite is Rolley-Hole. As supper time draws near its good to know you are in the right place for the best B-B-Q in the state! Word of warning…Monroe County B-B-Q is not fast food. Sure you can purchase a burger or grilled chicken breast sandwich but the heart of our B-B-Q is bone-in, two-handed, five napkin food! Shoulder steak, dipped in a vinegar based sauce to your specification, is the area specialty. A chicken sandwich is a half chicken between two pieces of bread! It’s getting late. Do you want to finish out your day with a movie at Sky-View Drive-In or a ride on the Cumberland River Ferry? If a movie sounds good, you’ll find the drive-in just out of town on Hwy. 163S. can travel to BurkesvilleKY, Celina TN, or turn around and come back…you’re always welcomed in Monroe County!